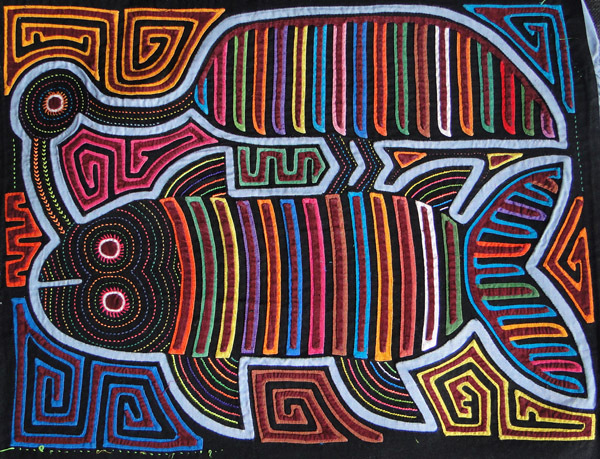 Mola is a textile fabric art characteristic for the Kunas, Cunas or Gunadule, an indigenous community living in Panama and Colombia in the Caribbean coast. 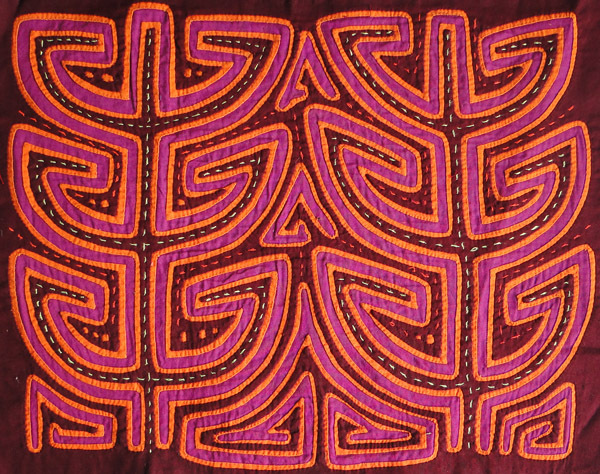 Molas are usually done in reverse appliqué technique, using two or more layers of cloth and cutting through to reveal the color underneath. The designs and patterns are totally individual for every artisan woman and shall incorporate both traditional and modern elements. 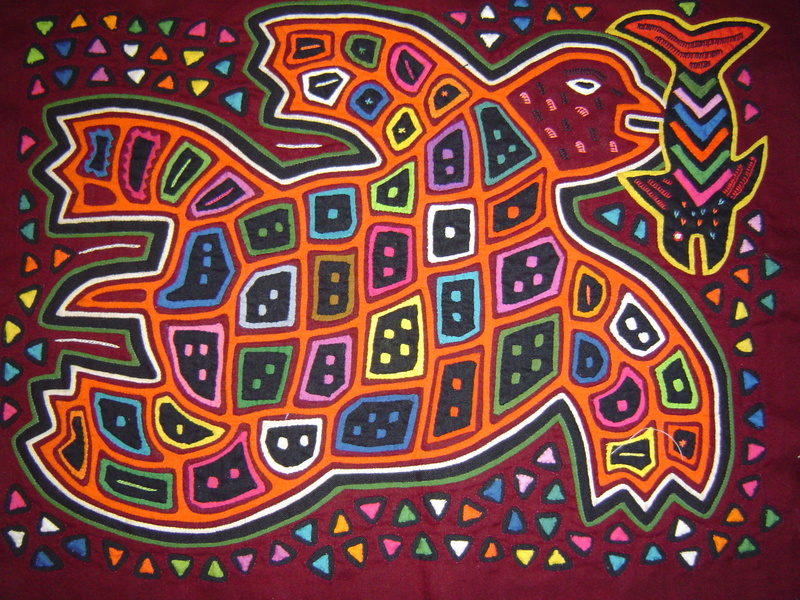 Early Mola designs were related to pre-Hispanic body painting; today Mola designs may include abstract geometric shapes, impressions of their daily life and rituals, motifs from nature, popular culture, as well as Kuna legends. 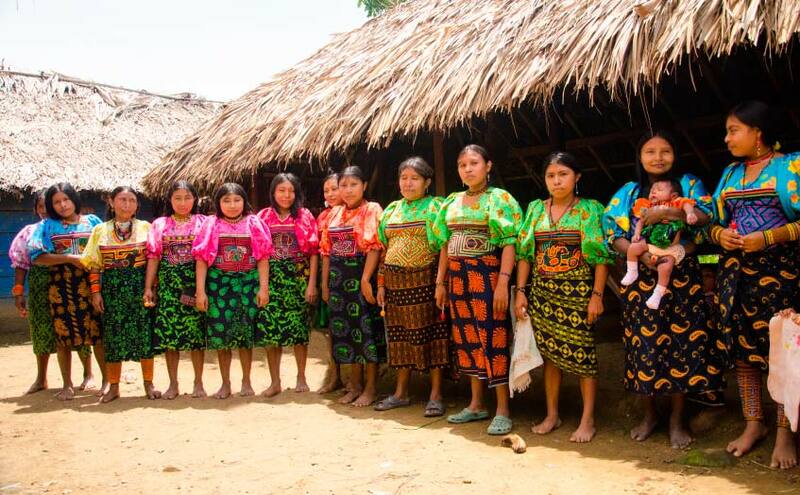 The word Mola in Kuna language means blouse or cloth and they are worn by all Kuna women along with their lives. 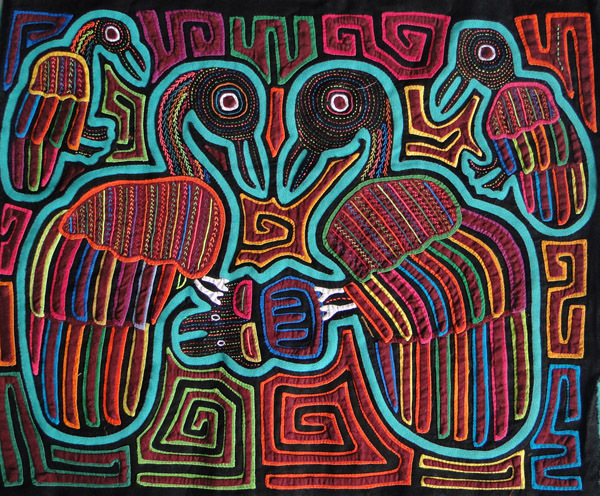 Each Mola art panel which is attached to a woman´s blouse represents an important phase of her life. When this phase is finished, they remove the actual panel and attach a new Mola art meaning the beginning of a new phase. 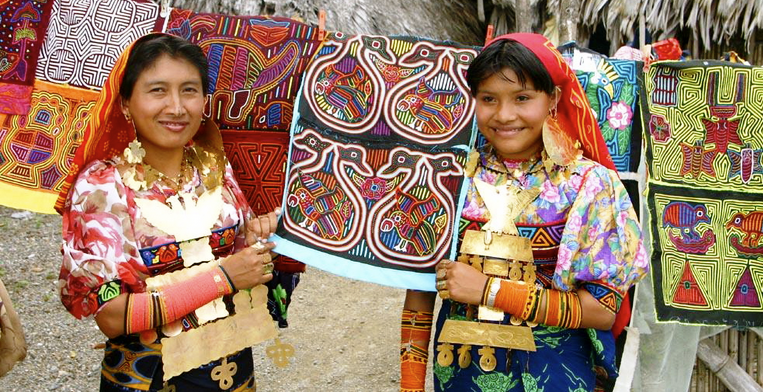 By wearing their own Mola blouse women feel safe because it has a protective meaning as well. Appreciating this textile Art based on ancestral traditions will arouse the feeling of being an owner of a unique ART piece, handmade exclusively for you! This beautiful textile Art technique is totally handsewn and depending on the forms and motifs of each Mola, the total making process can take from weeks up to several months until it is completely finished. The more layers a Mola has, the more complex it is. 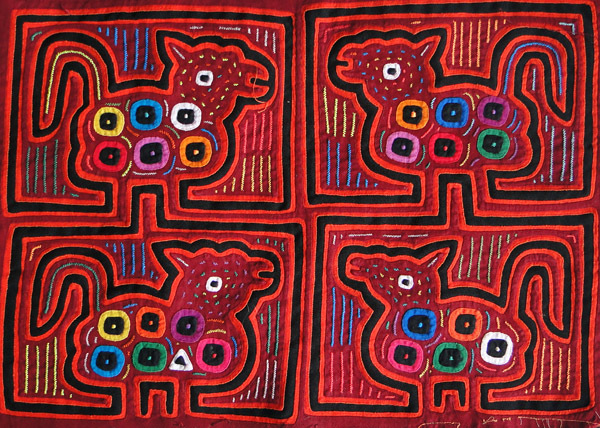 Molas are sewn by women although men can influence the design and interpretation of the Mola, especially when this contains a family event, character or ritual. 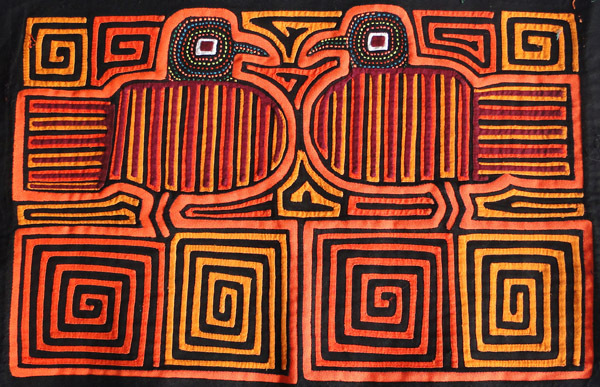 Women can spend many hours every day sewing Molas for their own (to add on their blouses), or to sell. 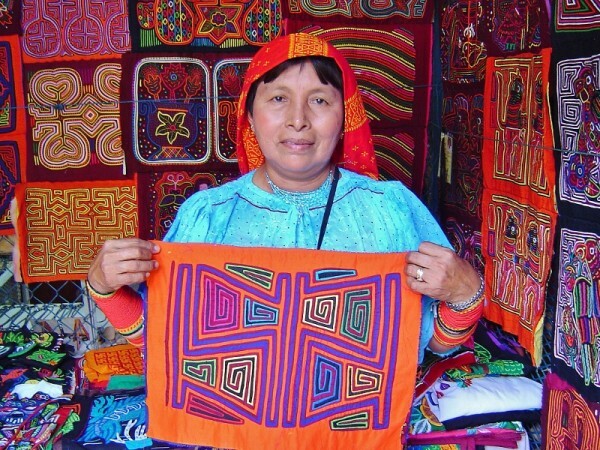 Sewing Molas is a tradition that goes from generation to generation and it has been rooted to the lives of the Kunas since the beginning of their time. It is normal to see seventh year old girls sewing their Molas next to their mothers, grand and great-grandmothers. 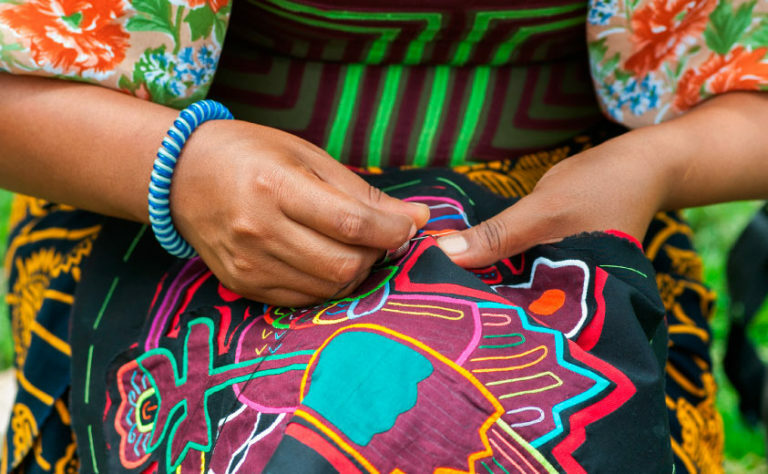 The making of Molas is as important as the Kuna people itself. 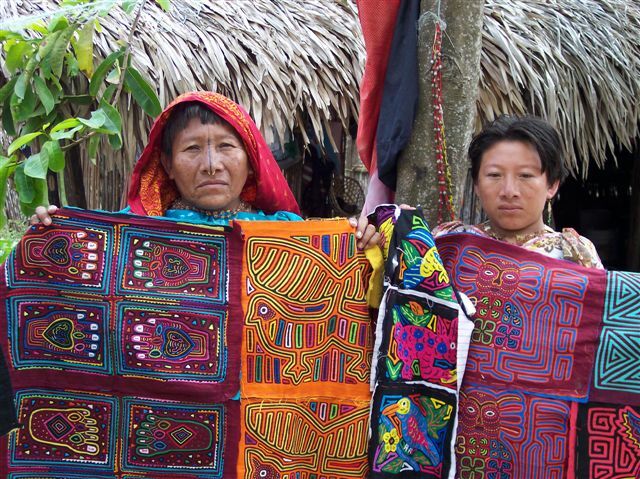 Molas are the representation of an entire indigenous community. 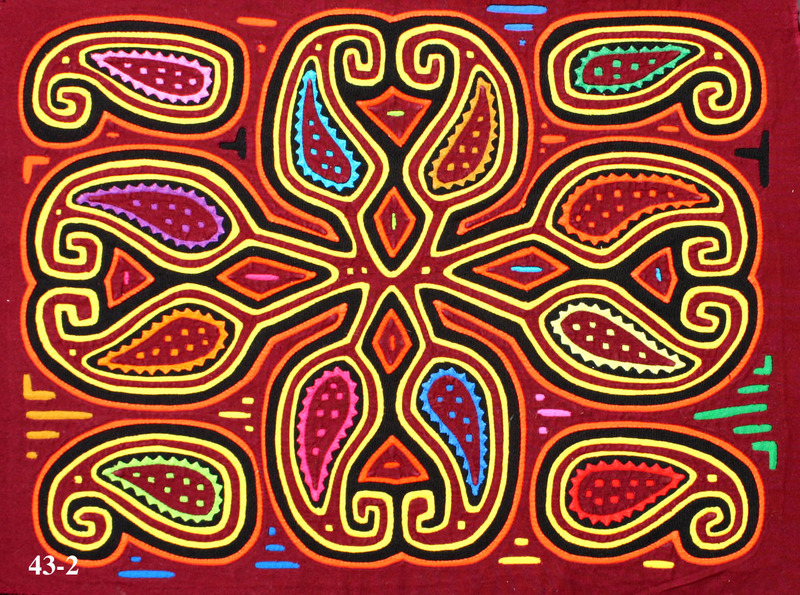 Through their Art, a culture is identified preserving our roots and origins. 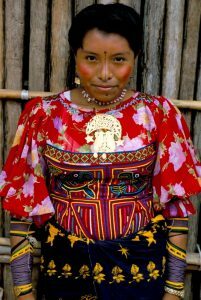 The Kuna or Guna-Gunadule culture is an indigenous folk located in its majority on the northeast of Panama in a vast region of 360 islands and reefs with approx. 61,700 inhabitants (year 2000). 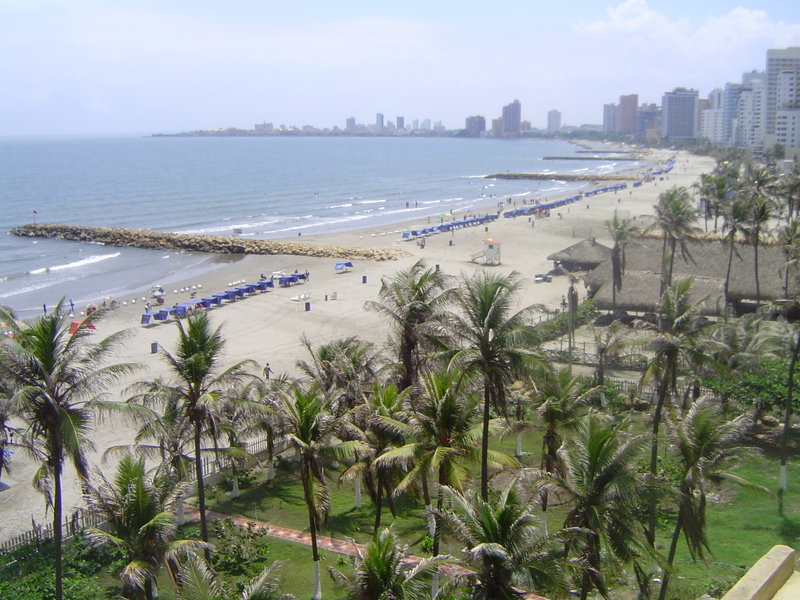 There are three mayor districts: Kuna Yala, Madugandí and Wargandí located on the provinces Panama, Colón and Darién. 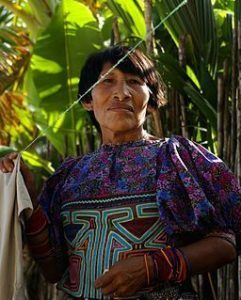 The Kunas also live in Colombia also known as Gunadule or Tule, in two communities with approx. 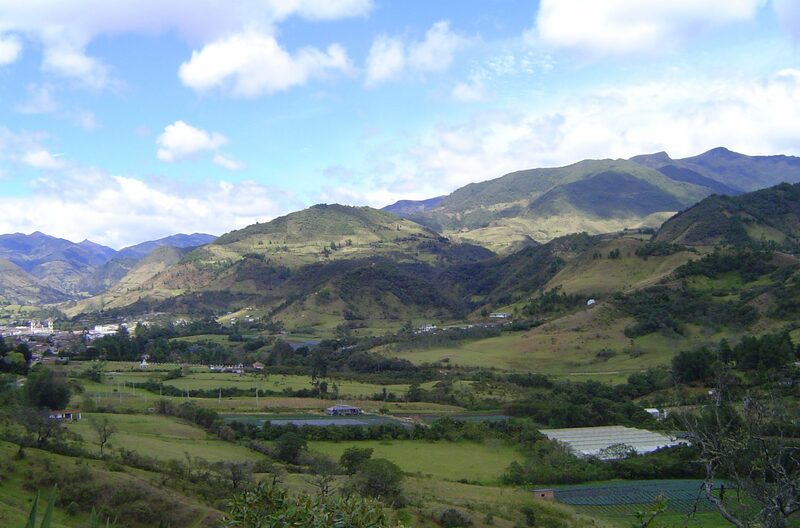 1,166 inhabitants in the zone of Arquía (Chocó), Caimán Nuevo, Necoclí (Antioquia) and Golfo de Urabá. Their economy is based on agriculture, fishing and hunting with a tradition of international trade, Coconuts, cocoa, and lobsters are the most important export products. Mola Art is one of its most important economic resources, placing women in a very important position within the community since they are the ones who create them since they are young. Tourism also has developed over the last decade in one of his most important sources of income. They live in houses of simple architecture constructed with canes but with a solid and resistant structure enough to endure the caribean weather. 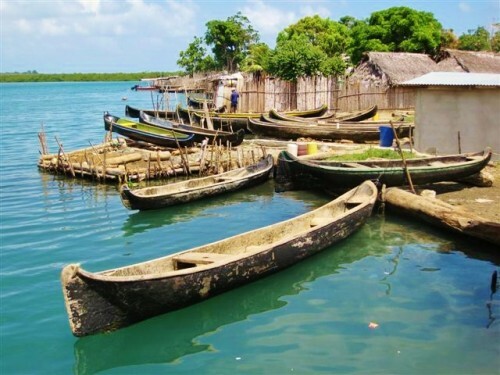 Although the villages are mostly located in islands, their places of work are in the nearby mainland, where they transport themselves daily by canoe paddles to work on their crops. During the Spanish conquest in the year 1500 in the Caribbean Coast and the Gulf of Uraba in Antioquia, the expedition came into contact with Kuna Indians for the first time. 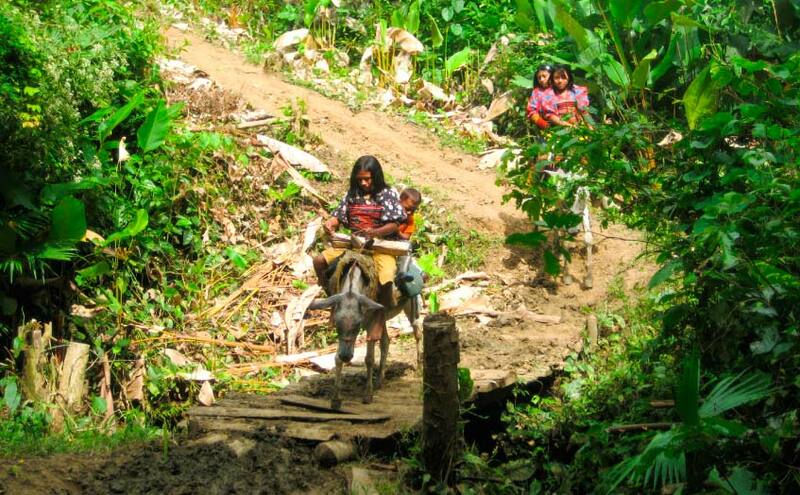 Their constant migration from the Gulf of Uraba in Colombia to the coast of San Blas in Panama (Panama was part of Colombia until 1900), was due to constant wars with another indian group (Embera Katío) but mainly due to the bad treatment by the Spanish conquerors. Due to this situation, Indians Kuna would ally with the British against the Spanish. They would concentrate on the rivers of the area to attack the Spanish but the Spanish Crown would respond to this threat with an order to annihilate the Indians Kuna. Due to this, they were able to move to the headwaters of the rivers Tuira and Chucunaque. 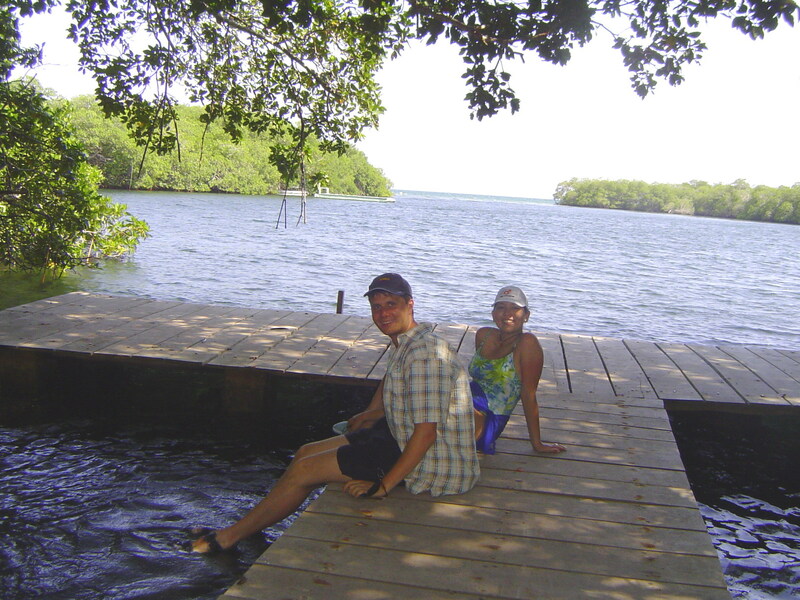 The Atrato River in Colombia would have been suitable for this channel dispersion to the east of Panama. 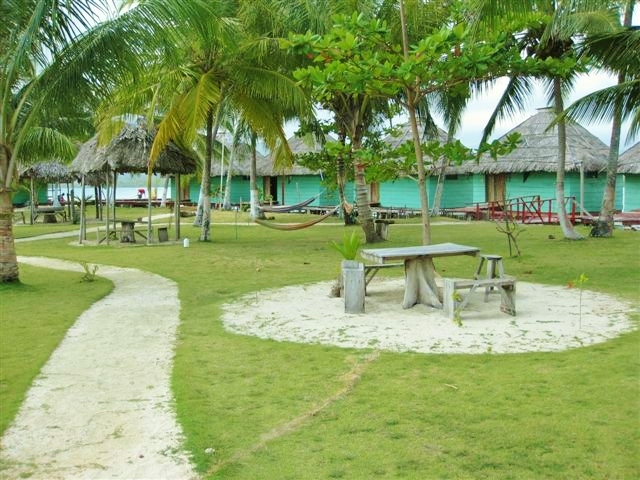 Finally, Indians Kuna would settle down more in Panama than in Colombia. My 1st. market on June 2015 in Berlin. Almost 10 years ago I moved from my home country of Colombia to Poland to start a new life together with my polish husband. 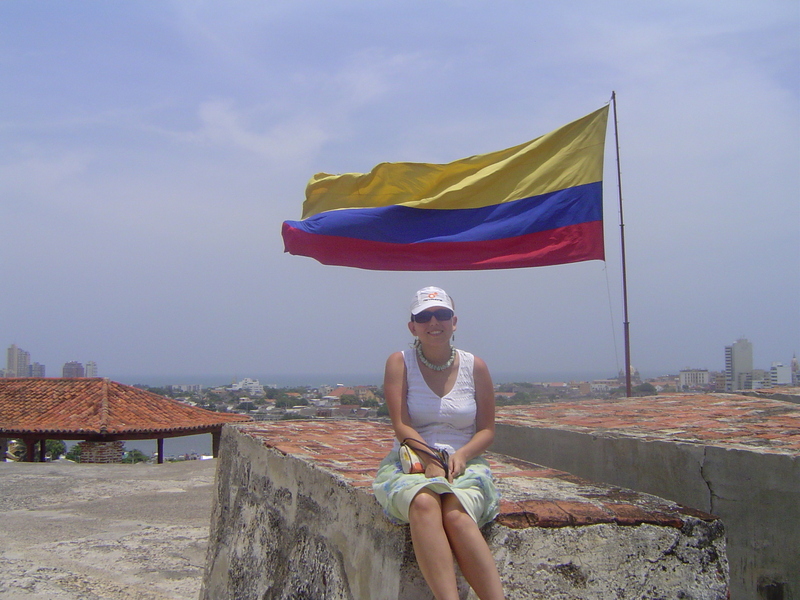 Quite quickly I became aware, that not many Europeans knew Latin America – and those, who do have an idea, associate Colombia with an unfair, negative image, so often shown in the world media. 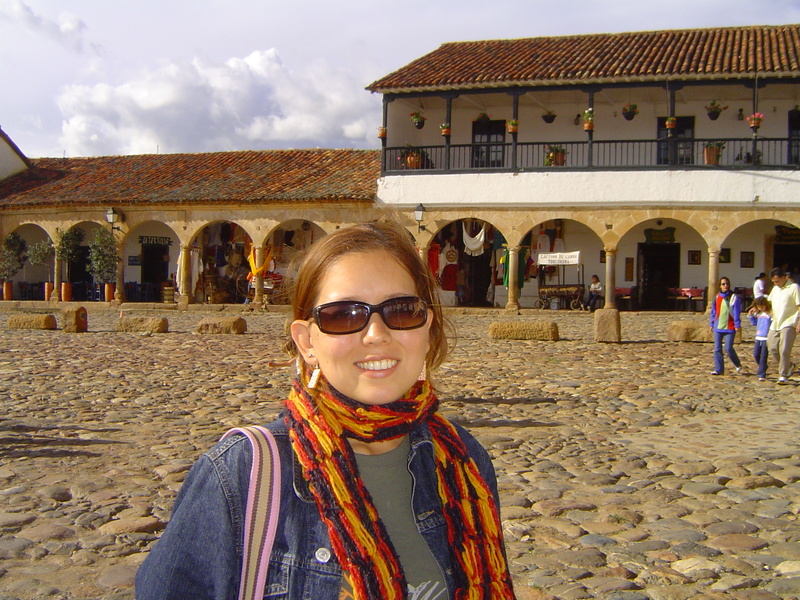 Once in Poland, I did some teaching work, and during Spanish classes, I was showing to my students the beautiful side of Colombia, our culture, and art. 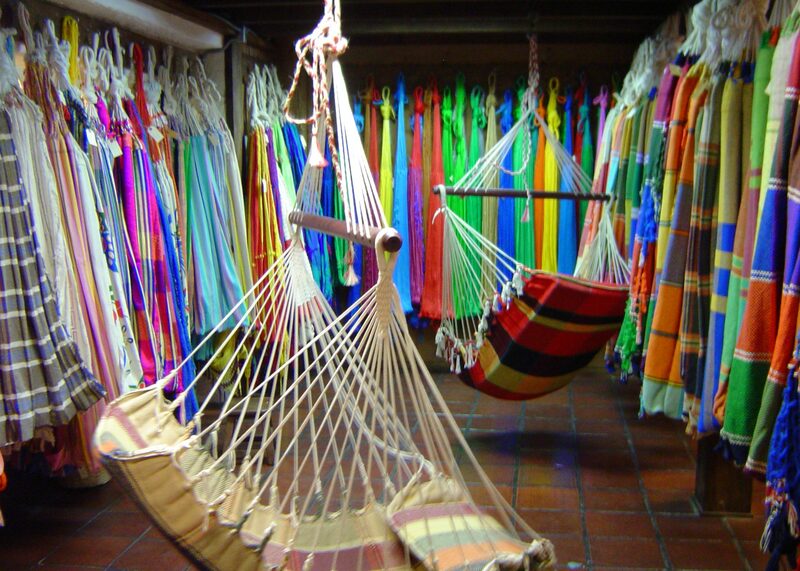 On many occasions, I was asked to show examples of Colombian folklore and some samples of Colombian craftsmanship. Later on, when I presented them, everyone seemed simply enchanted with materials used, their quality and precision – but most of all, by their originality and artistic value. 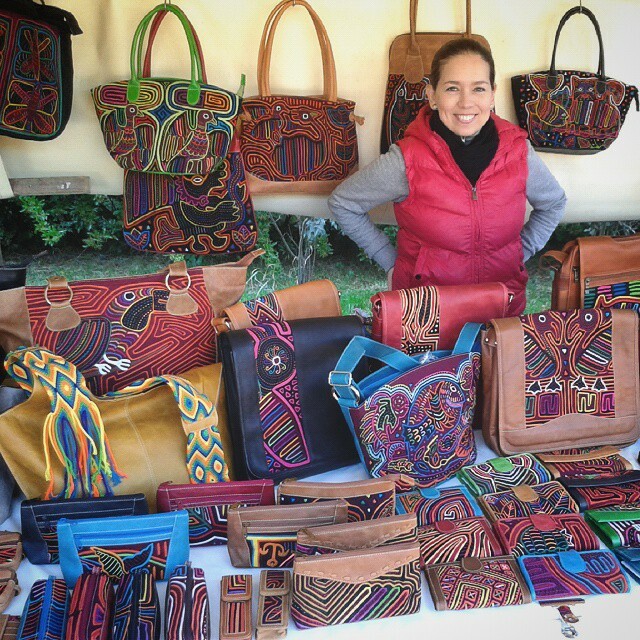 Maybe the most impressive was the fact, that most of the products were totally handmade by artisans and containing art expressions from Indigenous tribes still living in Colombia and creating unique cultural items – each of them was one of the kind! 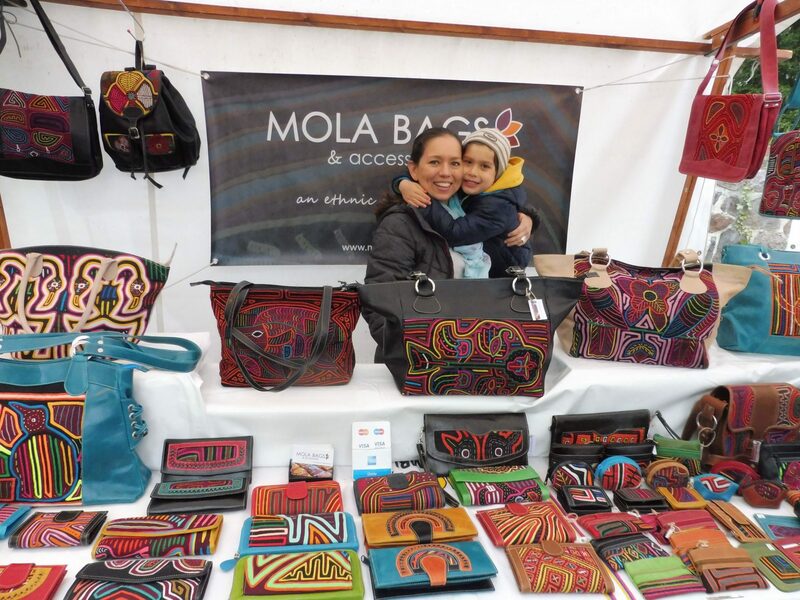 This experience founded a basis for the creation of Mola Bags&Accessories – a company created with the purpose of presenting on European markets the unique craftsmanship from native inhabitants of my beautiful country containing its art, culture, and soul. 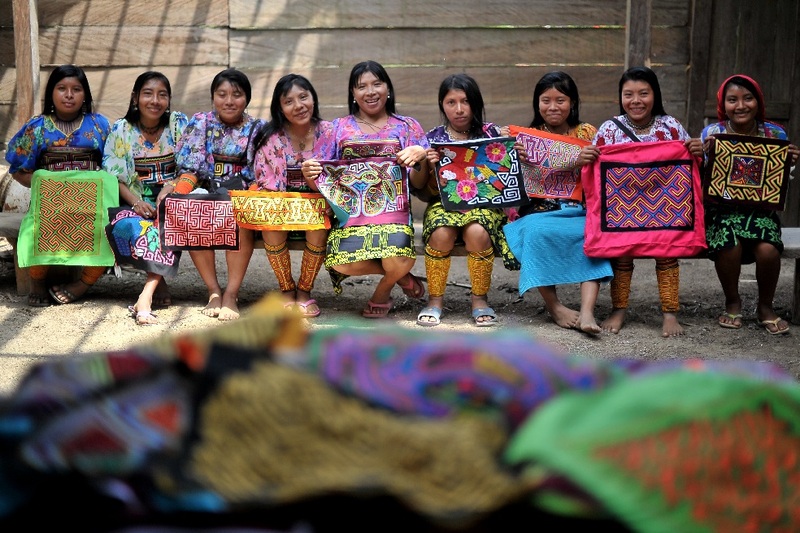 My mission is to create and maintain a connection between the indigenous communities and artisans in Colombia by promoting their ethnic art in Germany and offering better opportunities to improve their economic condition. Completing my industrial design studies in Colombia and Germany, I acquired knowledge about quality and its most important features of products we are using in our daily life. I like to think that I have an ability to discover and appreciate these objects, which somehow involve the cultural uniqueness of its place of origin. They are carriers of history and tradition of the regions and countries where they were manufactured. 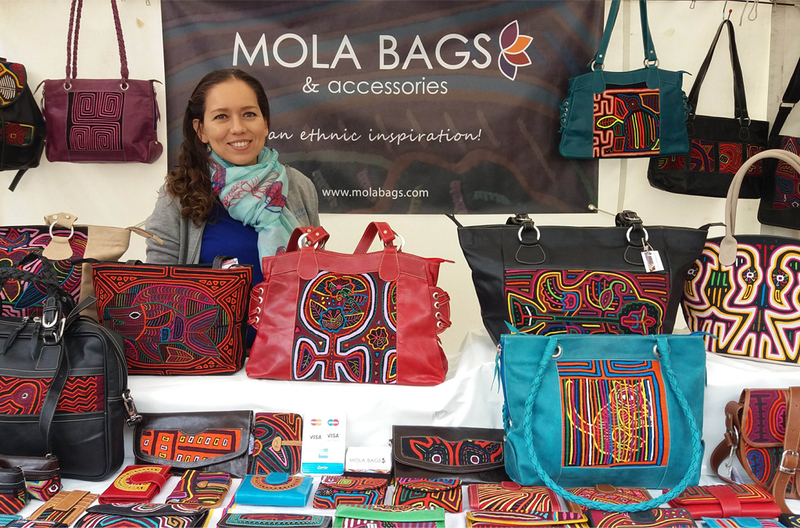 Mola Bags&Accessories shall allow sharing with its European customers the art and the beauty of Colombian Indigenous ethnic tradition. Items manufactured by Kuna Indians survived pretty much unchanged the pass of time and still allow authentic contact with their world. In this way, these products survive as well the fast-growing season's fashion consumption offering an item that will last for many years. Mola Bags&Accessories was born in early 2014 in Berlin committed to promote and create consciousness about the culture of Latin America in Europe, by means of beautiful, unique handmade products design for daily use and containing little part of our culture, tradition, and history. After living in Poland for some years we decided to discover and inspire the German market through this uniqueness of Colombian craftsmanship and now I live in Hamburg with my husband and our two kids. I visit Colombia very often where together with the artisan families we design and develop new articles for the German and European market.